You might remember from a few months back when Kaki King shared the story for her song Life Being What It Is with me for my Sunday Spotlight feature. It came from her fourth album, Dreaming of Revenge, which hit shelves about a month ago now. This last Sunday night I was fortunate enough to catch Kaki and her band touring in support of the album in Northampton, MA. Opening for the evening was Emily. That’s right, simply Emily (and her guitar). Kaki has included local artists to support the tour and Emily was brought on board for a handful of shows, including this one. 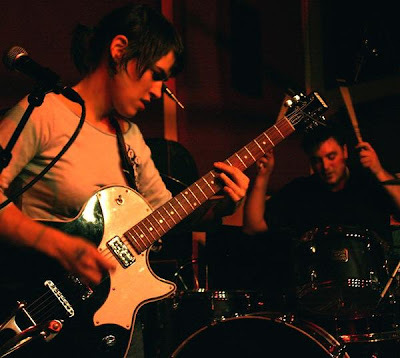 Imagining a woman and her guitar will give you some preconceived notions as to what you can expect, and while Emily didn’t radically veer from what you might imagine, she did spice things up with a handful of diverse covers mixed throughout her short set. The first surprise she dealt up was an acoustic cover of Michael Jackson’s Thriller. Even with no introduction, the crowd almost instantly caught on to what they were listening to. After another original, Emily re-interpreted Antonia Carlos Jobim’s Bossa Nova song Triste. Amazingly, even with just a guitar, Emily was able to capture the Brazilian feel of the tune. She was also able to pull off The Allman Brothers’ Whipping Post (in the middle of which she worked in Jimi Hendrix’s Manic Depression) and The Beatles’ Oh! Darling. All were delivered with a bluesy voice over her single guitar. If anyone out there has a link to Emily's website, please share so I can add it. The main event of the evening, obviously, was Kaki and her band. As can be expected from a guitar virtuoso, the stage was packed with guitars which Kaki drew upon, switching to a new instrument nearly every song. Most of the material from the evening was drawn from their latest release, which if you haven’t heard is a mix of instrumental and vocal tracks. I think for me, the most striking aspect of the album, even after having listened to it for a few months, is how different sounding and feeling some of the tracks are. On some there’s an airiness filled only by Kaki’s delicate vocals, but in others her voice picks up a deepness quite removed. Instrumentally, the album’s sounds parallel Kaki’s voice. In concert, this dichotomy is preserved. Perhaps the most entrancing part of the evening, as you could surely guess based on her reputation, was seeing Kaki work alone on her instruments. Listening to the album is one thing; it’s easy to imagine all sorts of studio chicanery when it comes to intricately woven sounds. Actually seeing how Kaki persuades those sounds to come out in person is another thing. Within her grasp the instrument becomes part drum, part piano (with the way her fingers play over the fretboard), part guitar. Even in person it's hard to believe what she can do. The band has a few remaining dates before Kaki heads down under to Australia. Catch her if you can. Visit her website, her label Velour Music, and become her friend on MySpace. Long time no comments. I like the new look. Thanks, glad you like. Mainstream version 2.0 just went up on Monday, and I must say, I'm diggin' it myself! hi, i don't like the new look, but the posts are also good in new design. 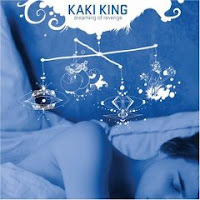 and: i love the new album by kaki king. Hey! I love the new look. That old blue color you had hurt my eyes. And Kaki is fabulous. I finally just got her new album so I'm pretty excited to listen to it. I'm curious to hear more of the vocals she's added to her songs, because she has such an unassuming voice. The couple of songs I've heard so far, I didn't really like (with the vocals), but maybe they'll grow on me. Thanks Stefanie, glad you like Mainstream 2.0! Hope you like the rest of Kaki's album as much as I do. Thanks for sharing the live, Filmore East verson of Whipping Post. Best live performance ever.